Adama Dieng, the United Nations Secretary-General's Special Adviser on the Prevention of Genocide, condemned Israel for having committed crimes against humanity and genocides against the Palestinian people. “What happened in Sabra and Shatila is a crime against humanity and all acts of mass-execution are crimes against humanity,” Adama Dieng said as he briefed reporters at UN Headquarters in New York. The Special Adviser on the Prevention of Genocide has been appointed by the UN General-Secretary to raise awareness of the causes and dynamics of genocide, war crimes, ethnic cleansing and crimes against humanity. At least 5,000 Palestinian refugees were mass-murdered in the notorious Sabra and Shatila massacre perpetrated in Lebanon by the Israeli occupation forces (IOF) and Lebanese Phalange militias in September 1982. The UN adviser voiced his belief that the latest operations in Gaza might have led to war crimes emanating from the disproportionate use of violence by the IOF. He said preliminary findings and probes currently conducted by the UN Human Rights Council into the offensive are expected to be released by next March. 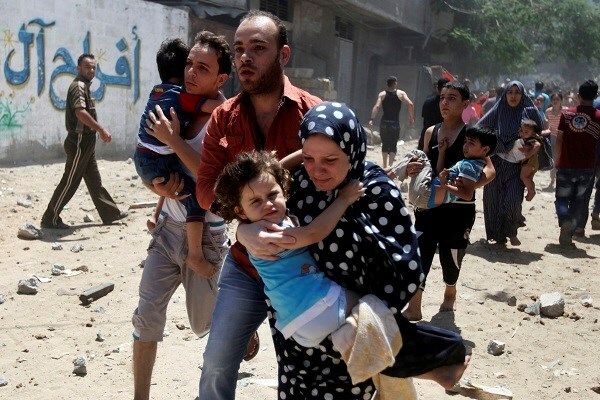 At least 2,000 Palestinians, including 500 children, were killed while more than 11,000 were left wounded in the latest Israeli offensive on the Gaza Strip launched on July 8. The Sabra and Shatila massacre took place in two adjacent Palestinian refugee camps in Beirut, Lebanon, between September 16 and September 19, 1982, and was carried out by Lebanese Phalangists militias under the protection and support of Israeli forces. The massacre came as a revenge for the killing of the Lebanese elected President Bashir Gemayel, leader of the right-wing Christian militias, as it was carried out two days after his assassination. Sabra and Shatila massacre was carried out only one day after Israeli forces occupied Beirut and dominated the Palestinian refugee camps and controlled the entrance to the capital under the pretext 3,000 Palestinian fighters affiliated with the PLO were left in the refugee camps. The Lebanese militias savagely murdered hundreds of innocent Palestinians and Lebanese including women, children, and medical crews of the neighboring hospitals. The massacre was implemented under the supervision of the Israeli War Minister at that time Ariel Sharon, the Former Chief of Staff Rafael Eitan, and the former leader of the Lebanese Phalangists Elie Hobeika. The exact number of victims is disputed from 900 to 3,000, especially that large numbers of unidentified victims were buried in unknown graves. The massacre was met with indignation on the part of the international community, forcing Israeli former Prime Minister Menachem Begin to form a special commission known as Kahan Commission to investigate the massacre circumstances. Following a four-month investigation, the Kahan Commission concluded that Sharon was deemed indirectly responsible for the massacre. Sharon was forced at that time to resign from his office and disappeared from the political scene for long years. However, he was elected Prime Minister in 2001. During his mandate, Jenin massacre was carried out. 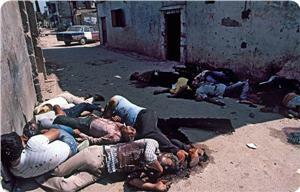 Sabra and Shatila massacre constituted the darkest stain on Ariel Sharon's reputation and Israel’s colonial history. 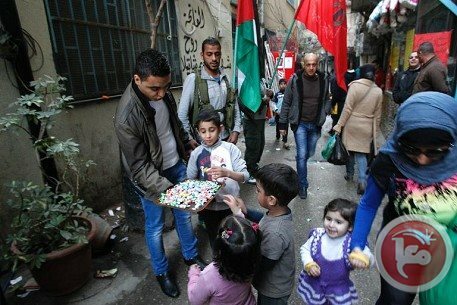 Adel Makki rushed into the street in Beirut's Shatila Palestinian refugee camp Saturday to hand out sweets when he learned of the death of Ariel Sharon, the Israeli leader Palestinians blame for a massacre of hundreds there and in the nearby Sabra camp. "I was relieved when I found out that Sharon was dead. I think the (eight) years he spent in a coma were punishment from God for the crimes he committed," Makki, age 19, told AFP. Over three days, beginning on September 16, 1982, hundreds of men, women and children were massacred in Sabra and Shatila on the southern outskirts of Beirut. Some 500 more simply vanished without a trace, among them Makki's uncle. Israel had invaded Lebanon three months before, and the brutal killings, the work of Israel's Lebanese Phalangist allies, were carried out as Israeli troops surrounded the camps. Sharon, who was defense minister at the time, was forced to resign after an Israeli commission of inquiry found he had been "indirectly responsible" for the massacres. Ten-year-old Ahmad Khodr al-Gosh said Saturday: "I took a piece of candy because the assassin is dead. He killed hundreds of women and children. We are now relieved." The narrow alleyways of the impoverished Shatila camp came to life when the news broke. People poured out of their miserable dwellings to celebrate the passing of Sharon, who died Saturday in a hospital near Tel Aviv after spending eight years in a coma. "You want to know how I feel? I want to sing and play music, that is how," said Umm Ali, a 65-year-old woman clad in black whose brother Mohammad died in the massacre. "I would have liked so much to stab him to death. He would have suffered more," she said of Sharon, as she walked slowly, linking arms with a young relative. Many residents of Sabra and Shatila said Sharon should have been prosecuted, echoing the statements of many compatriots in the Palestinian territories and rights watchdogs. Sarah Leah Whitson, Middle East director of Human Rights Watch, said "it’s a shame that Sharon has gone to his grave without facing justice for his role in Sabra and Shatila and other abuses." Shopkeeper Mirvat al-Amine agreed that Sharon should have been put on trial but she is also confident that he will meet divine justice. "Of course I am happy that he is dead. I would have liked to see him go on trial before the entire world for his crimes but there is divine justice and he cannot escape that. "The tribunal of God is more severe than any court down here," she said. Outside the shop Magida, aged 40, says she is still haunted by memories of the massacre. She and her family had fled Shatila just before the killings after sensing that something was not right, she said. They sought shelter in an adjacent park and waited. "A neighbor joined us, her dress was covered in blood. She told us that people were being massacred in the streets," said Magida. "At first we could not believe it but later we began hearing screams, we heard people begging their assassins to spare them." When Adnan al-Moqdad heard the news about Sharon, he went to the cemetery in Sabra to pray for the soul of his mother and father, killed in the massacre. The Moqdads were Lebanese but like many impoverished families had their home in the sprawling camps. "How can anyone forget the massacre," he asked "Sharon is responsible. God is Great and he made him suffer to the end of his days and he will make his suffer after his death."